Martha, as hostess, took care of decor and set-up/serving pieces, Stacey did the beautiful invites, cupcake toppers, and punch, and Mandi and I took care of the food. Anyway, I signed up to make mini sandwiches, as well as lemon cookies. 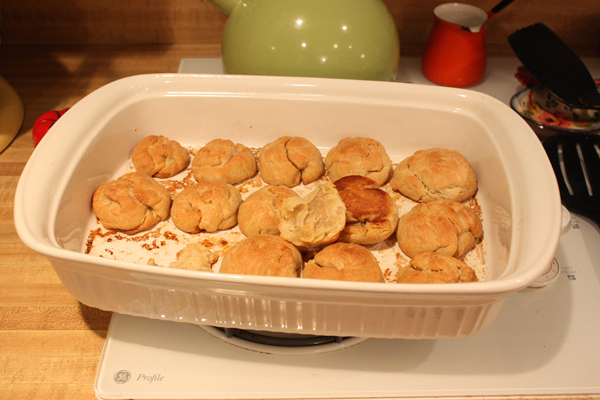 Besides, I'd seen several yummy-looking recipes for biscuits/rolls recently, on a perennial fave, Joy the Baker. 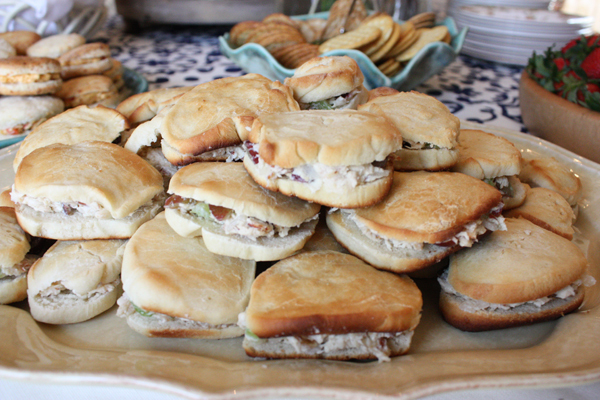 First up, the plan was Joy's Parker House Rolls with my friend Carrie's chicken salad. Not sure what happened. I did something wrong. Something with the yeast? Foaming/not foaming? Still not sure what exactly. But they did not turn out. I went on to make the rolls from the famous Mrs-Michelle-Cinnamon-Rolls recipe, because I remember her saying they made delicious rolls in their own right (sans cinnamon, etc). And they are. Or, they do. 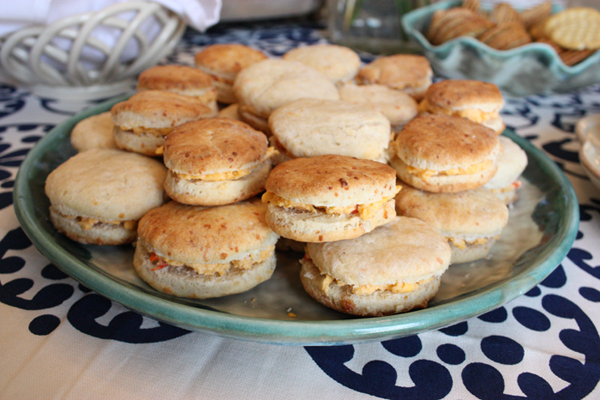 Next up, was pimento cheese sandwiches, in Joy's Cheddar/Black Pepper Biscuits. I use this pimento cheese recipe, with sour cream instead of cream cheese [just because it's easier to stir, not because of taste. I've never tried it with cream cheese before but I bet it's great. it is cheese, after all.] If you're looking for a good p. cheese recipe, this may be it: just enough spice, just enough mayo, just enough flavor, just enough easy. This biscuit recipe is a dream. No yeast, no wait time...just some fun with the pastry cutter, everyone's favorite health buddy Shortening, and CHEESE! 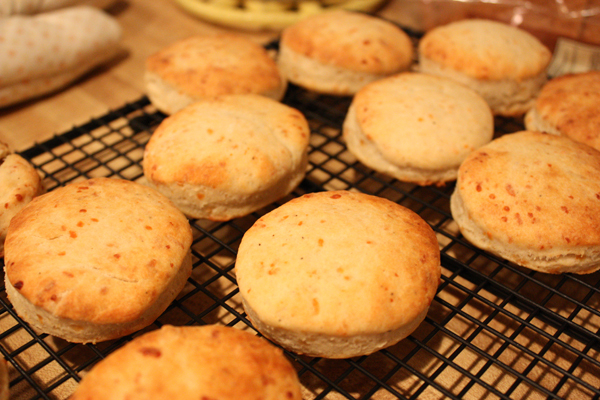 Oh, and I used Monterey Jack cheese in the biscuit since I was using sharp cheddar in the pimento cheese. 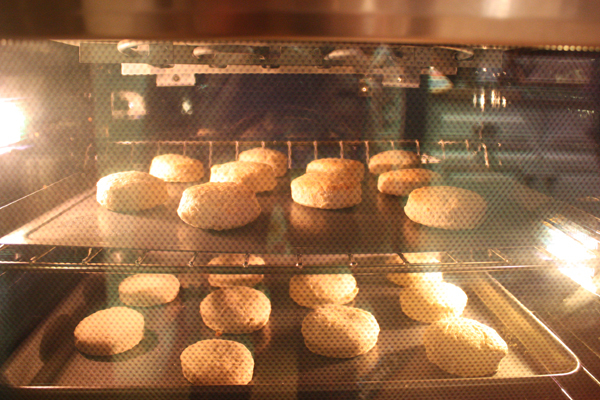 Here are the biscuits in the oven...as my pride begins rebounding from the Parker House incident. I doubled the recipe, and didn't roll them as thick as she calls for, since I was making sandwiches with them and didn't want the bread-y-ness to overwhelm the pimento cheese. Is it a Southern thing to be in love with pimento cheese? Or is it a low-carb thing? Maybe because it's flippin' delicious. Survey said the two together were not overwhelmingly cheesy [pun intended? ], but made a wonderful pairing. I cannot wait to make these biscuits again. They were fun, easy, and yielded a crowd-pleasing result. Don't let the pastry cutter scare you off...just get your two forks out and get to work! 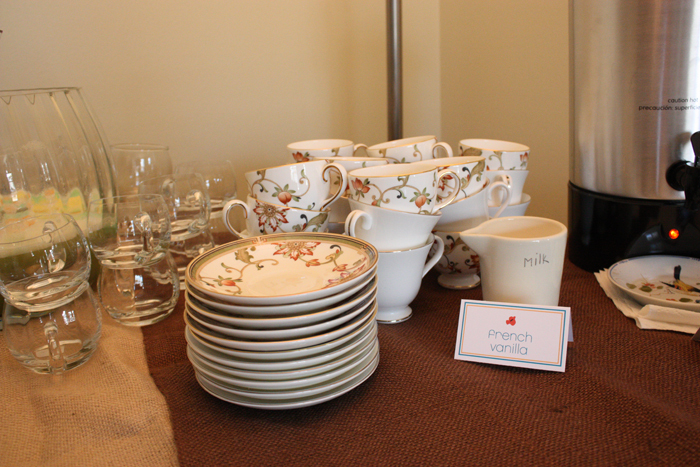 By far, my favorite part of the party was using Martha's and my china. The idea came to me the week before the shower, when we were discussing who would bring cups/plates/napkins, etc... I said, Why don't we just use the salad plates and cups/saucers of our china? ...but yet very "adult." But somehow, not too fancy. and I just LOVED seeing our patterns mixed together; the silver rim and simplicity of mine with the gold rim and lovely design of hers. Not one single item was broken or chipped...but we did give ourselves pep talks a la why-do-we-have-this-stuff-if-we're-not-going-to-use-it. Thanks for letting the celebration of your baby be an excuse to try out new bread recipes and be a total freak. Those biscuits look amazing! well done!!! I'm totally impressed. Will you bake for me!? 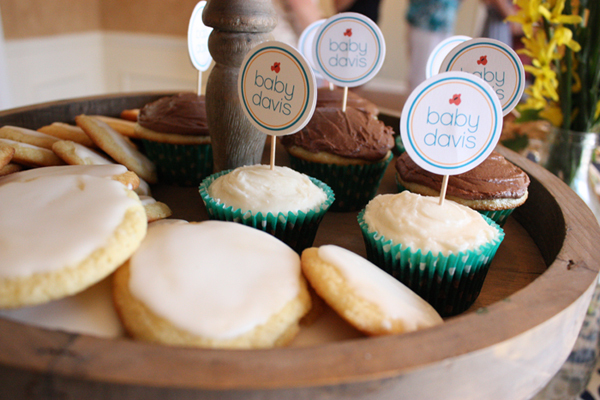 when i saw the baby shower post on martha's blog, i was totally hoping you'd post recipes. i NEED those cheese biscuits. thanks! You know I loved those sandwiches! Sooo good and so pretty. Everything was delish! I must say we are still indulging in the sweets. I loved everything about the shower. Way TO GO Gals! I LOVED the food. Remember? I didn't move away from the food table the whole shower. Seriously. Yummy! I love that you try all these "fancy" and hard recipes that I would never try and report back to us. I might have to try the biscuits now. The only reason I did the cinnamon rolls was because of you! lovely shower--I think the idea of compiling everyone's china is a great one!